There is no salad as refreshing as a delicious Greek salad and this one is all that, but with a twist in shape (literally in the shape) of zucchini noodles which really make the salad pop and sizzle. 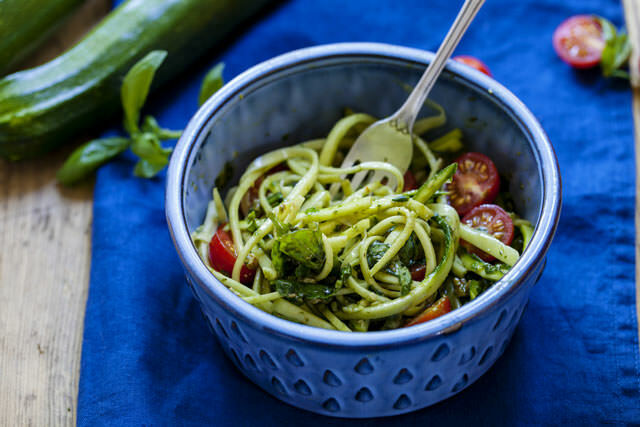 Use the spiralizing tool to make the zucchini noodles (zoodles). Put them in a bowl and add tomatoes, cucumber, olives, feta cheese and red onion. Prepare the dressing by whisking lemon juice, olive oil, oregano and salt and pepper in a small bowl until smooth. Pour the dressing over the veggie mixture and toss. Leave in refrigerator for 15 minutes before serving, to let it marinate.